Eos was the Greek goddess of the Dawn in Greek mythology, and although her name might not be amongst the most famous of Greek deities, Eos played an important role in bring light to the earth each day. Eos was a second generation Titan in Greek mythology, being the daughter of the Titans Hyperion (Heavenly Light) and Theia (Sight). Thus, Eos was sister to Helios (the Sun) and Selene (the Moon). The primary role of Eos in Greek mythology was to rid the world of the darkness of night, and to announce the imminent arrival of Helios, the Sun. Thus it was said that Eos would emerge from the realm of Oceanus in the east upon her golden chariot, a chariot pulled by two horses, Lampus and Phaethon, and would thus precede Helios across the sky. Before descending at the end of the day into the realm of Oceanus in the west. Some writers though would state that once darkness had been eliminated, Eos would leave her own chariot and climb aboard the chariot of Helios, a chariot pulled by a different Lampus, Erythreus, Acteon and Philogeus. Thus brother and sister would enter the realm of Oceanus together at the end of the day. Each night, Eos would travel through the realm of Oceanus to ensure that she was back in position in the east for the start of the next day. The role of Eos is almost identical to that of the Protogenoi goddess Hemera (Day) who worked hand in hand with her brother Aether (Light), to remove Nyx (Night) and Erebus (Darkness) from the earth each morning. There is no mention of Hyperion, Eos’ father fighting during the Titanomachy, the war between the Titans and Zeus, and so it is probable that Hyperion and his children remained neutral. Thus, after the fall of the Titans, Helios, Selene and Eos all kept their roles in the cosmos, at least until the importance of Apollo and Artemis increased greatly. The most prominent surviving stories of Eos in Greek mythology deal with the love life of the goddess. To begin with Eos was most closely associated with another second generation Titan, Astraeus, the Greek god of Dusk, and a deity associated with the stars and planets. The relationship between Eos and Astraeus produced a number of children; the five Astra Planeta (the visible planets of antiquity), Stilbon (Mercury), Hesperos (Venus), Pyroeis (Mars), Phaethon (Jupiter) and Phainon (Saturn); and the four Anemoi (the Wind gods), Boreas (north), Euros (east), Notos (south), and Zephyros (west). 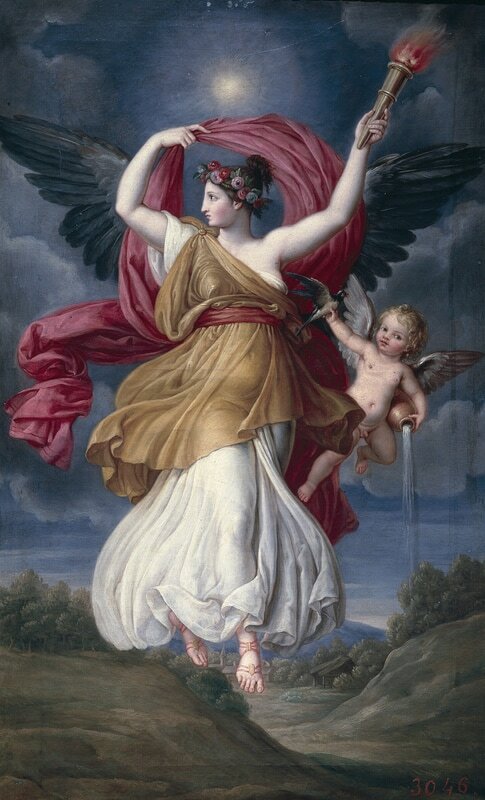 Eos is also occasionally named as the mother of Astraea (Virgin Goddess of Justice) by Astraeus. Eos as also named as a lover of Ares, the Greek god of War, and although this relationship did not produce any children, it did cause the goddess Aphrodite to become extremely jealous, for Aphrodite was a more famous lover of Ares. To prevent Eos from competing for the affections of Ares, Aphrodite would curse the dawn goddess, so that Eos would only fall in love with mortals thereafter. Eos would thereafter become associated with the abduction of handsome mortals. One of the first of these was the legendary hunter Orion, who Eos abducted after his sight had been restored. Eos would take Orion to the island of Delos, and in some versions of the Orion myth, this caused the death of the hunter, for a jealous Artemis might have killed him there. Eos would also famously abduct Cephalus from Athens, Eos ignoring the fact that Cephalus was married to Procris at the time. Eos would keep Cephalus with her for a long time, possibly as long as eight years, and Eos would bear Cephalus a son named Phaethon. Cephalus was never truly happy with Eos, despite being a lover of a goddess, and would long to return to his wife. ​Eos would eventually relent, and took him back to Athens, although before departing she showed Cephalus how easily Procris could be led astray. The most famous mortal lover of Eos though was Tithonus, a Trojan prince, and son of King Laomedon. Eos and Tithonus were said to be happy together, but Eos was by now weary of her mortal lovers dying or leaving her, and thus Eos asked Zeus to make Tithonus immortal, so that they could be together for eternity. Eos had not been specific enough in her request to Zeus, for Zeus granted the request, and Tithonus would not die, but he did continue to age. As time passed, Tithonus grew frail and infirm, and pain started to wrack through his body. Eos went to Zeus to ask for his help, but Zeus decided that he could not take away the immortality that had been freely given, nor could he make Tithonus young again. ​Zeus decided instead to transform Tithonus into a cicada, and even today, in certain parts of the world, the cicada can be heard with the arrival of Dawn each day. The relationship between Eos and Tithonus did produce two sons, Memnon and Emathion, two rulers of the land of Aethiopia. Emathion would be king for a while, but the son of Eos was killed by Heracles, when Emathion rashly attacked the demi-god as he sailed up the River Nile. Memnon is the more famous of the two sons of Eos and Tithonus, for Memnon would lead a large army to bolster the defences of Troy. Memnon was adorned in armour made by Hephaestus, and in the defence of Troy killed Pheron and Ereuthus. Memnon would meet his match when Achilles entered the battlefield to retrieve the body and armour of Antilochus, the son of Nestor. Like Memnon, Achilles was adorned in armour made by Hephaestus, but Achilles was the more skilful fighter, and Memnon would die by the sword of Achilles. Eos would mourn the death of her son, and the morning light was less brilliant than it had been before, and the morning dew formed from the tears of Eos. Eos also asked Zeus for special recognition for her dead son, and so Zeus made the smoke from the funeral pyre of Memnon into a new species of birds called the Memnonides. These birds would migrate from Aethiopia to Troy each year to mourn at the tomb of Memnon.